The Vortex XL will do all the jet boat things - race across shallows and adventure up rocky rivers - but Paul Smith says it's also a family boat well suited to lake and coastal use. Hamilton Jet has long promoted the advantages of water jet propulsion for general application in lakes and sheltered coastal waters. So, in addition to their range of river boats, the company has almost always had models which cater to this market - the Jet 52, 53, 73, 83, 190 and 210 models immediately spring to mind. 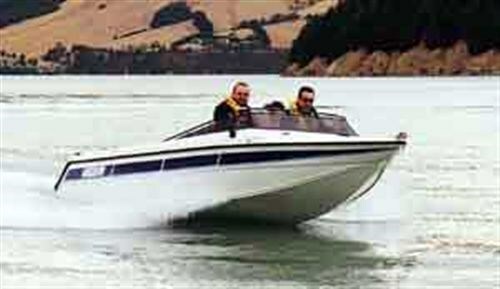 With the increasing popularity of aluminium as a cost effective construction medium, these older designs in fibreglass have been superseded by Hamilton Jet's Vortex range of open runabout models. This range includes boats which cater for both river and lake/sheltered coastal work. The fundamental differences between the two involve overall length and deadrise configuration. The immediate impression when one sees the 5.8m Vortex XL is the abundance of cockpit space - about 2.1m from the dashboard to the front of the engine cover. The back to back bucket seats with storage under provide comfortable seating for four forward and small dickie seats in each rear corner alongside the engine box could be supplemented with a double bucket in front of the engine cover if desired. The driver has a comprehensive array of instruments to monitor engine functions and performance including a tachometer, speedometer, engine coolant temperature, oil pressure, volts, fuel gauge and engine hour gauge. Sited to the left is a hand throttle override control for the foot throttle, while the Morse heavy-duty controller for the forward/reverse bucket is to the driver's left hand. The front passenger has access to a large glovebox with an integral non-slip step to aid access over the windscreen and on to the foredeck. Toward the stern, the GRP engine cover has a quick release system to provide unobstructed access to the engine for routine servicing and maintenance, while its top has an upholstered pad that matches the upholsterey throughout the boat. The portofino stern design includes non-slip swim steps on either side of the jet unit cover, a ski rope locker and towing eye, and handles to aid access to the boat across the transom by skiers, divers or swimmers. Naturally, with a jet, such access can be contemplated without fear of injury from an exposed propeller. The GRP deck features two rod holders, a set of navigation lights, an anchor locker integrated into the foredeck and a roller fairlead. The alloy hull has a 10mm thick delta centre section flanked by 5mm outer bottoms. A 3mm transom and 2.5mm topsides provide a strong platform for the deck. The 21° deadrise and absence of planing strakes on a 5.8m overall length and 1.88m beam make for a smooth ride at cruising speeds of around 30 knots. The turned down chines deflect spray down and away from the cockpit, a feature we appreciated as we progressed against the easterly chop. 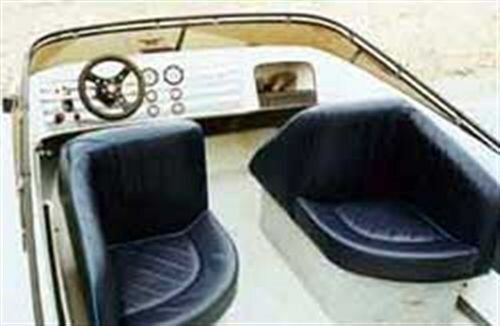 The boat was fitted with a Chevrolet-based 5.7 litre V8 engine rated at 300hp at 4600rpm. Of cast iron construction for durability in the marine environment, the engine is marinised by the American company Marinepower and features throttle body fuel injection. It is close-coupled to a Hamilton 212 water jet fitted with a 2.4kW "turbo" impeller which held the engine down to a little more than 4000rpm at wide open throttle. The beauty of this impellor is that it offers tremendous thrust off the mark and, coupled with the lazy nature of the large capacity V8 engine, gives a very relaxed cruise at 3000rpm for a speed of around 28-30 knots. 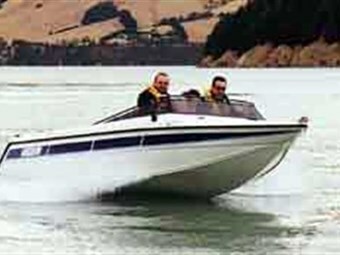 Although this boat had not been used for some time prior to our review, the engine started immediately and moved into a preset warm up programme before settling to idle at 800rpm without any driver input on the throttle at all. Herein lies one of the beauties of the modern technological age. The exhaust note was pleasantly subdued from the single 75mm outlet on the large inboard muffler. Once the engine had reached operating temperature, the boat was eased off its trailer. The efficiency of the large reverse bucket on the 212 jet is aptly demonstrated in such a manoeuvre as no additional throttle was required. The immediate response of the boat to the helm means low speed manoeuvrability is unsurpassed. Such tasks as coming along side another boat or the dock, approaching the trailer, control around skiers, divers or swimmers - which can be difficult in conventionally powered craft due to "propellor walk" - can be executed with ease and precision in water jet propelled boats. This example was fitted with a Morse rack and pinion steering system, which provided a full turn on the steering wheel from lock to lock. This is substantially more than the chain and sprocket systems commonly fitted to river-going jet boats, but was sufficiently light and responsive for the design task and application of this boat. The hull handled well in a variety of water conditions we encountered during our test. Despite its length, the boat responded well to throttle assisted turns under severe driver provocation. We had a ball practising emergency stops in a deserted section of calm water. This involves engaging reverse thrust (with care) and bringing the boat to rest from 25 knots in less than a boat length. The cockpit remained dry and free of windblown spray throughout our time on the water, while the 21 degree deadrise ensured the jet remained primed whatever the water conditions. 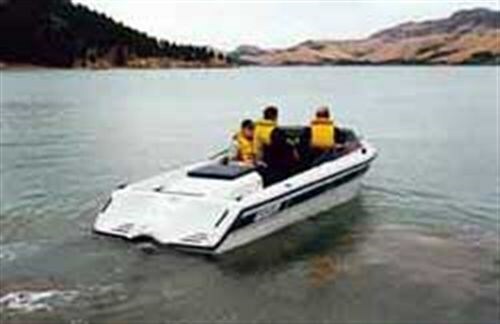 Within the context of multipurpose jet boat, the Hamilton Jet Vortex XL makes an ideal family runabout, ski boat and fishing platform with all the safety and performance advantages of a powerful water jet propulsion system for use in lakes, deep and slow moving rivers or sheltered coastal waters. This example travelled on a Mudgway multiroller, single axle galvanised steel trailer fitted with hydraulic over-ride disc brakes. Towing was easy, as was launching and retrieval. New price as tested approaches $60,000, which puts it at the top end of the recreational jet boat market. Construction: 10mm 5083 marine grade alloy plate centre section, 5mm outer bottoms, 3 mm transom, 2.5mm sides, GRP deck.